St. Adulf or as some spell it Adolph, was born into a Christian English family of nobility in the 7th century. He had a brother Botulf and the two of them were sent by their parents to study in Belgium. 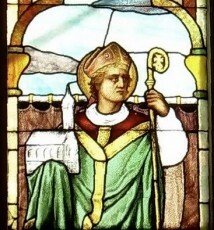 His brother Botulf became a Benedictine Monk and returned to England, but Adulf remained in Belgium and became a Bishop. He is said to have been a good Bishop and he and his brother founded a religious house in 654, and were widely respected for his holiness. Virtually nothing is known about his life. The story, which originated with the life of his brother, was that Adulf was a bishop and is honored today as a bishop. The monastery at Iken, in East Anglia, was destroyed in Viking raids. It is said that when by the orders of Ethelwold of Winchester, Botolph’s body was disinterred for translation to the new abbey of Thorney, Adulf’s body was buried with it, and as it proved impossible to disentangle the bones, the remains of both saints were taken to Thorney, where the relics of Adulf remained. St. Adulf shows us how to become a saint, not by doing great things, or performing miracles – or even martyrdom. He shows us by his simple life of learning the faith, growing in the faith, and retaining our faith until our end – we can become saints as well. So many of us catholics would fall into this type of sainthood – if we just remain faithful to the Church in little ways, every day of our life. St. Adulf shows us that remaining steadfast to our faith, and striving for holiness, we too, can become great saints – something we are all called to be.